Soundwings™ announces the release of Elliot Deutsch’s full length album The Push! 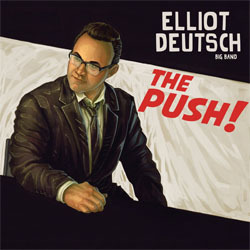 Soundwings™ is proud to announce the release of Elliot Deutsch Big Band’s full-length album The Push! Proclaimed by Bill Holman to be a “young star in the field of jazz composing and arranging,” Deutsch has assembled a top-notch 16-piece ensemble of some of the finest musicians in Los Angeles. The Push! embodies a youthful, exuberant jazz ensemble sound that, while influenced by the great records that came before it, pushes the genre in a new and exciting direction. Every note of the album oozes with the joy Deutsch feels when he stands in front of his world-class band. Several of the pieces on The Push! have already won awards, including “50 Piece McChow Down,” where was awarded ASCAP’s prestigious 2013 Young Jazz Composer Award. In 2012, Deutsch’s arrangement of “Pure Imagination” received top honors in ASMAC’s Big Band Arranging and Composing Competition. Following that honor, he was invited to perform at ASMAC’s 75th Anniversary Celebration in front of Los Angeles’ greatest composers and orchestrators. Also in attendence was producer Jason Lee. Lee contacted Deutsch about producing a new record and putting The Push! into motion. In June of 2014 Elliot Deutsch Big Band recorded 10 of Deutsch’s pieces at historic Capitol Studios with engineer Steve Genewick. Welcome to the NEW patrickwilliamsmusic.com! Thanks for taking the time to visit the new website. There are a ton of new features that we hope make your time on the site that much more enjoyable. There really is too much good stuff to include in one post. From the mobile optimized website, a better way to purchase and listen to Patrick Williams’ music online, to the latest events as they occur, there are improvements to just about every area of the site. Take a look around and let us know what you think in the comments. • For those of us who are always browsing on the phone. You can now enjoy patrickwilliamsmusic.com on mobile devices such as smartphones and tablets! • Check out the new “Shop” where you can purchase CD, Scores & Parts, and download music. Check back often as new items will be added regularly as they become available. • Want to find out about upcoming performances, or just want to stay updated on current and future release from Patrick Willams and other Soundwings™ artists? Check out the “Events” section. • If you’re not already following Patrick Williams on Social Media, check out the left of the screen for direct links to Patrick’s Facebook, Souncloud, YouTube, iTunes & Spotify. • Stay tuned for upcoming “Blog” posts from Patrick Williams himself, discussing a variety of topics from his illustrious career.